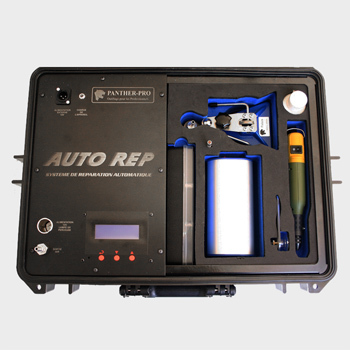 Panther Pro's latest windscreen repair tool, the AUTO REP, is designed to make it one of the easiest repair systems on the market. A completely self- contained, battery- operated system that can run all 12v tools directly, without the need to use a customer's power source. Once the injector bridge is correctly positioned all the user needs to do is select the type of damage that is to be repaired, choose which type of windscreen repair resin to use and press go. When the repair is finished, the machine will let the technician know with an audible beep and then the user simply needs to finish the repair with some pit-fill resin and cure with the UV lamp. Please visit our web site for more windscreen tools.